Just over a year ago the third season of Community ended with three episodes on a single night, beginning with “Digital Estate Planning,” which took place largely within Journey To The Center Of Hawkthorne, a retro-style video game. Shortly thereafter, an intrepid Redditor recreated a small, explorable version of the game that attracted a small group of dedicated developers, who have continued to update the game over the course of the past year. The group recently celebrated their one-year anniversary, and though the game isn’t complete, it’s a much more immersive and game-like experience instead of a few different environments to look at. Various contributors have produced over 200 costumes for 20 different characters, including just about every possible permutation a fan could want. The levels have expanded to cover not just New Abedtown and Gay Island, but connector environments that require much more skill, and a weapons system that allows players to pick up and create weapons to take down mariachi players and unicorns that shoot rainbow lasers. The early versions of the game were always open, easy to skip to any level, look around for a bit, see the environment, and then leave. But as development has progressed, Hawkthorne has become more fully formed. Players have to get through each level to gain access to backtracking around the map—which involves a bit more patience to get through a few tricky caves that hide some nice weapons. 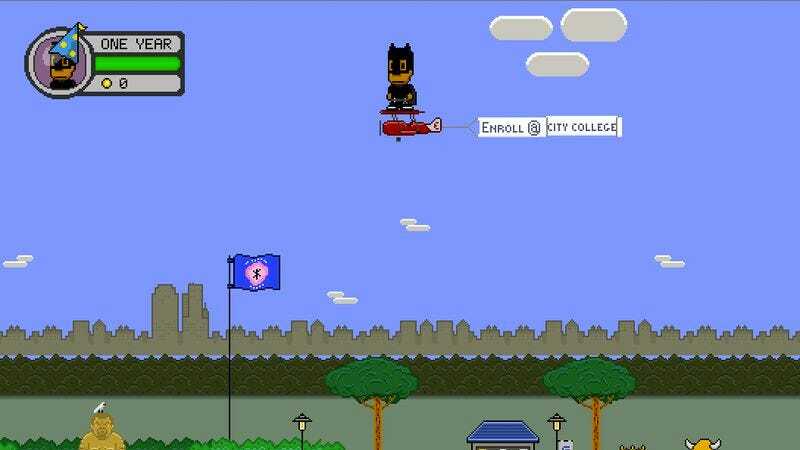 The best surprise reward remains the Greendale level, accessible once players reach the end of the main game and collect a key. There are plenty of hidden secrets all around the game, making it a wonderfully immersive bit of fun for any Community fan. Download the one-year anniversary edition of the game here, for Windows, Mac OS, and Linux.